VOTE NO! FOR THE $107,320,000.00 WISD BOND! 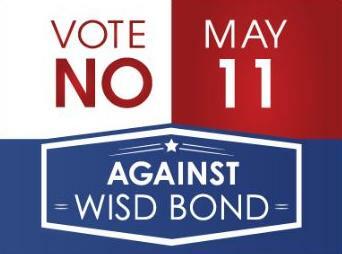 Why Vote NO for the WISD BOND? Because we are Taxed Enough Already! Maybe you have heard the comment, “why would anyone vote against the children”? Let me be clear, I’m not voting against the children, I’m casting myself as a guardian against excessive spending. Weatherford families and small businesses are facing difficult times, and now is not the time to make matters even worse by asking taxpayers to pay for a $107,320,000.00 Bond. Safety and Security are being campaigned as the Number 1 reason we need the $107,320,000.00 Bond.